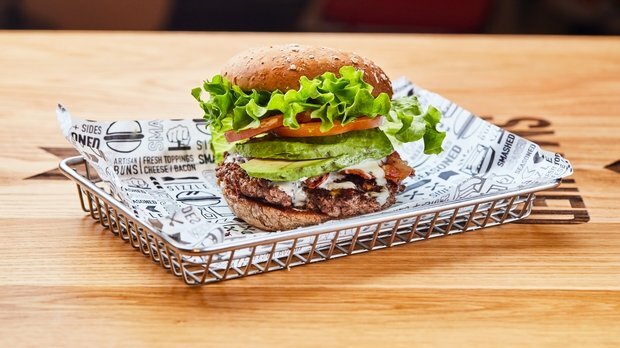 Upmarket US fast-casual chain doing well-seared smashed burgers, thick milkshakes and contemporary interior design. Situated on pedestrianised Sauchiehall Street, Smashburger is well placed for hungry shoppers who fancy cranking their fast food experience up a notch. Fashionable industrial-chic features meet McDonald’s-style components – registered trademarks dotting the menu, counter service, a self-serve Coca Cola machine, plus an attractive but underused-looking upstairs dining area. The USA chain’s USP is the ‘smash’ bit – basically squishing a meatball between a mammoth, mechanical clamshell grill, which cooks the burger in just 70 seconds. The result is a thin, well-cooked pattie with a raggedy-edged homemade appearance. This all works well if going for the classic cheeseburger, for example, because the simple toppings make the unique taste of the burger sing. If choosing a pimped-up option, such as the Local Smash – rich stilton offset by tangy chutney and crispy bacon – you might want to bang an extra pattie in or else the taste of beef might go astray. Sweet potato ‘smashfries’ coated in olive oil, rosemary and garlic are great – if slightly greasy. And who needs dessert when you can have a milkshake made with Häagen-Dazs, served with a spoon because, yes, it’s that indulgent.